This is just a great way to describe the mentality when things are going well. When the water is high, all the problems seem to disappear and the mood is elevated and working on long term results seems less important. 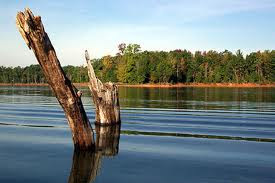 When the water is low, the problems (stumps) show above the surface. The mood of staff and boards gets a bit ugly. Tempers can flare. If panic sets in, it’s easy to loose your way. Collaborate when it makes sense to do so and is practical and relevant, but evaluate whether action is occurring and abandon process if stagnant. Building a culture of excellence will always pay off. Focus on it. Cultivate it. This is a great way to get through the tough times. Change is good, as we live in a constant state of it. Be an agent for change with a philosophy of always keep improving. What does your association do when times are great (or bad)?